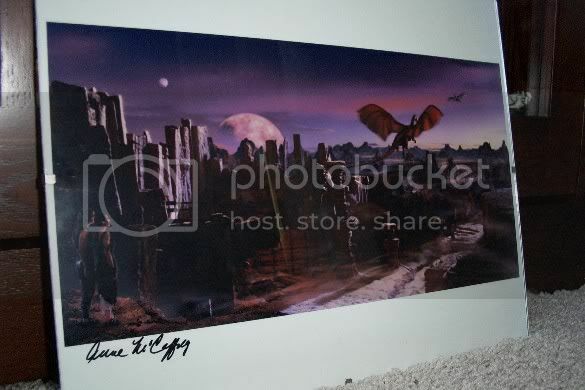 As most of you know, in 1999 Alliance Atlantis and Zyntopo were close to putting the Dragonriders of Pern on TV. It was a much hoped for event that, unfortunately, was ended just before casting was to be done. They did give away a cel from their production though. They actually gave away 25 cels, each signed by Anne. I was lucky enough to win a copy! I was rather surprised by the darkness of the planet. I guess it could be an evening view or maybe early morning with the dragons and riders greeting the morning sun. (I like the second idea the best) I'm also guessing that the large planet is the Red Star, it's not too red, but probably wouldn't be really a dark red. Could that be F'lar and Lessa in the corner? What do you think of the portrayal of Pern? 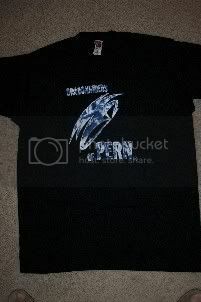 Another TV show collectible is the Dragonriders of Pern t-shirt given away at DragonCon in 1999. There were 1000 of the shirts made. Front of the tshirt - it says Dragonriders of Pern with a stylized dragon in the middle. Back of the tshirt - it has pern.com at the top (tho the site no longer exists as it did then) and the company logos below. I remember after the TV show was canceled that there were some actual models of the characters that came up for auction on eBay. I was rather shocked that they could sell that stuff and emailed Anne about them. She told me that she didn't think those sorts of things were to be sold, they were property of Zyntopo or Alliance Atlantis. Oh, how I wish I'd had the money to purchase some of those models! (the technical term is maquette, I believe, thanks to Cheryl for supplying the term when I couldn't remember it!) Although, now that I think on it, I thought it rather tacky that they were being sold and wouldn't have bought them if I'd had the money. Let's hope that the new movie deal will actually come to a theater near us soon! 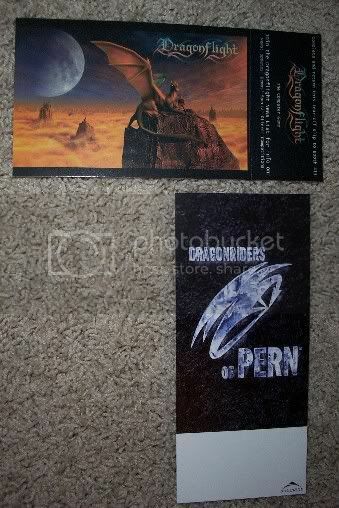 And there will be wonderful new Pern toys to collect!!! the Black post card is the one from the TV show that never made it. And the other is the card for the Grolier Game. 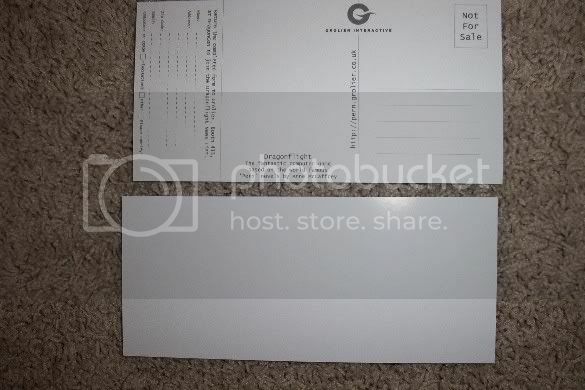 The TV show card is blank and the Dragonrider Game card has a post card section with the web address for the game updates, which is no longer a valid web site. There is also a stub that could be torn from the post card and turned in to the Grolier booth to join the Dragonflight News List. These are not signed by Anne, obviously, but the ones I've got that are signed are in with the drawing of Anne that I did. So that makes a pretty complete DragonCon 1999 Dragonflight collectible list. Oh, wait! I just thought of one other Dragonflight related giveaway. No photo of it will be put up tho. It is a shortened version of Dragonflight that Del Rey gave away. Their booth was right next door to the Atlantis Alliance booth for the TV show. I think it contains a chapter from Dragonflight or something like that, I don't remember. (tho if I happen to think of it tomorrow I'll check, too tired right now. y'all are lucky I did the pics of the post cards) I'm off to get some ! A wonderful collecting highlight, Becky. I remember well the report Cheryl made for us of her visit to that particular Dragon*Con, report that can still be read on het site, and her meeting you! It was a wonderful and special Con! I'm very jealous that you have one of the cels, Becky! But at least I have a t-shirt! I don't have any signed -- I managed to miss all the signings Anne did at that DragonCon. Cheryl, sorry you missed out! Anne wasn't supposed to sign anything during that time! Donna and I didn't even take anything for her to sign because she had hurt her writing arm and was told by the dr not to do any signing. And when we happened to basically 'stumble' upon her at the Dragonriders of Pern booth well, we sure wished we'd brought stuff with us! But she'd been signing those cards so we picked up a few. I don't know if I have any extras or not. I'll have to check later. Haven't done so yet because my father in law is in the hospital, had to have a stent put in an artery in his heart. He's still in hospital but we're hoping he comes home tomorrow. (this is one of the reasons why we wanted them to move closer to us) We're glad they were here an not back in Bellingham. Ow... Becky, I hope your father's operation will go smooth and safe! Hans, yes patience is a virtue, and I do believe you have several and as slow as the mail is, patience must be one of them. Say if either one of you( Cheryl or Becky) finds an extra one of those cards, just let me know what you want for it..... hint, hint, hint!!! I know that's a very interesting information/promotion pack, originally made for investors. I don't own one but was able to document and photograph it at Anne's home. Did you buy it? If yes, I'd be interested in the price you paid and the way you acquired it. I have just emigrated to New Zealand and have kind of rediscovered stuff I had forgotten about! It has a covering letter signed by Eric Weymueller to the person I bought it from. I've finally got a PC friendly copy of the promo reel done, I've uploaded a small copy to youtube. Oh, thank you, diogenese. It was woinderful to see the old Zyntopo / Alliance-Atlantis TV promotion again and especially see Anne in the animation room. Unbelievable that this is already well over 11 years ago... How time flies. If this venture hadn't been embarked upon this board might never have exited as the possible TV series resulted in a Pern forum by AA and from there Alec McCaffrey started the Kitchen Table and from the ashes of the Kitchen Table this forum arose. And nice to see how they do that, + Anne, and time flying for sure! I have a VOB file that is much better resolution but it is 440MB so I haven't uploaded it. I was sure I had seen you all before, it must have been on the Kitchen Table! did the user accounts get brought over after the closure of KT? When I tried to sign up it said I had a dormant account here. Thanks for uploading the video, I look forward to getting a chance to see it! No, this forum started from scratch, as did the other forums that sprang up after the KT was closed. I think one site had hoped to bring over the membership database, but it was realized pretty quickly to be a privacy violation to share that info. But, we do have a lot of the same members who use the same member names. If you had a dormant account, then you must have signed up for it here. The records say you registered back in Jan 2007. As far as I know the video was never posted anywhere, certainly not after the dreams did not come true. I have seen the actual video (VHS tape) at Anne's home but never anywhere else. I came over as I have some family here, and I can afford to buy a house on mechanics wages. I ended up here as it's where I got a job offer I like it as I'm a country boy at heart, even Timaru is too big for me and I can't afford a lifestyle plot! I only lost one plate in the main shake, fell off my table! Thank you for the link, diogenese! I enjoyed watching it! And it sure doesn't seem like it's been that long sine we awaited the premier of the show. I'm still disappointed, as I'm sure we all are, that the show never came about. It was sooooo close tho! WOW, WOW, WOW...Diogenese, how can I express my thanks to you for sharing your link. I missed your post completely, until today...sorry! To think I have missed getting to see this video for so many months . Getting to see Anne included in your video was fantastic...not to mention what almost was. until now I had only seen a few photos of what was done for the T.V. show. I missed this link before, probably because we had just moved when you posted it. Thanks so much! It was GREAT to see!! that is great !! You can finally see how BIG the dragon's are. Nice to see.